Be a Part of AIA PA EPiC in 2018! 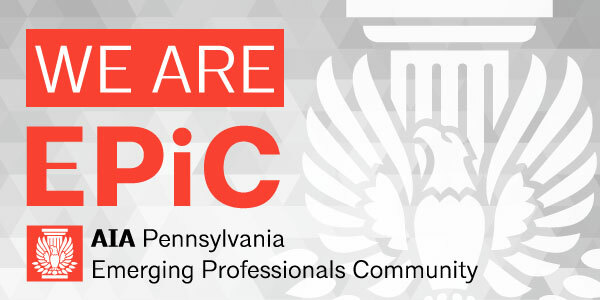 The AIA Pennsylvania Emerging Professionals Committee is establishing the AIA Pennsylvania Emerging Professionals Community (EPiC) to improve the network, role, and impact of Emerging Professionals throughout the Commonwealth. AIA Pennsylvania “Emerging Professionals” are architecture students, Associate AIA members, and Architects licensed for 10 years or less. To promote the professional development of Emerging Professionals in the Commonwealth through leadership, mentorship, and fellowship. Provide a platform and programming for members to have fun, while building relationships, developing leadership skills, and increasing emerging professionals’ involvement in the profession. Act as a liaison between Government Affairs Committee. Stay up to date and provide insight into AIA PA Advocacy Issues. Review other states advocacy and civic leadership programs. Champion the AIA PA Political Action Committee. Promote Architects Action Day. Assist with the development of EP focused skill building webinar. Responsible for advocating for Architects in the Community & Emerging Professionals in the Workplace. Lead discussions regarding “Firm Fostering EP Recognition” and advance endeavor. Maintain school contacts, schedule date of visit & select best committee Members to attend. Act as a liaison between AIAS & Architecture Schools Committees. Support local components with PALM development. Update meeting topics as required. Participate in committee conference calls and an in-person meeting, usually 1x a year. Act as a liaison to EPiC from your local chapter’s Emerging Professionals community. Communicate key information concerning Emerging Professionals from EPiC back to your respective local chapter. Bring issues to the committee that are relevant to Pennsylvania Emerging Professionals. Work with the committee chair to develop an Emerging Professionals program or session for AIA Pennsylvania’s Annual Conference and assist the chairman in securing a sponsor for that session. Direct inquiries from Emerging Professionals concerning the IDP and the ARE to AIA Pennsylvania’s IDP Coordinator. If you are interested in getting involved with AIA PA EPiC in a Leadership Position or as a Chapter Representative, we would like to hear from you! Please contact EPiC Chair, Joe Adiutori, Jr., AIA with your interest or any questions. We look forward to your interest!